While fireworks only go on sale today, the so called ‘one night’ of stress has already been in full swing in many areas since the beginning of October. A group of horse owners in Rodney, who have all suffered loss and injury of animals, began collecting data last year under the name “Ban the Boom NZ”. They believe it is the first time that anyone has objectively collected evidence on whether fireworks really are just a ‘one day’ wonder as many supporters claim. They also began to collect information on injuries and death of animals, and the costs associated both with preventative and damage related costs. The reported fireworks data shows fireworks are no longer used on just the 5th of November. Instead fireworks begin in October, hit a peak which runs from mid-Nov to mid-January and continue right through to the end of February. Even the depths of winter is no longer free from annoying and frightening bangs, no month is entirely free from fireworks. Anecdotally, public or commercial fireworks usage may be contributing by seeming to encourage those with caches of fireworks to use them after hearing or seeing pyrotechnics. 60% of survey respondents had purchased some form of calming medication or product for their pets during the peak period. Many expressed their annoyance at having to spend their hard earned cash, and others were frustrated that they had to put up with the noise and stress for months on end without ever being able to tell when fireworks were going to suddenly be let off. Those who had suffered serious injuries and even loss of animals, were annoyed that expensive veterinary bills and loss of stock costs could rarely be recovered, and they were often greeted with derision by neighbours who refused to compensate them for financial losses. Ban the Boom NZ are campaigning for greater care this year, particularly in or near rural areas. It is vital that people in lifestyle areas notify their neighbours if they intend to use fireworks, and be prepared to accept the costs if they cause damage or injury or death to their neighbours stock. This time of year is when foals are being born; young animals and pregnant mares are particularly sensitive to loud noises. Other stock and animals can be injured, killed or in the case of cows reduce productivity and those living in rural areas should be aware of the financial as well as the emotional costs they put on their neighbours if they use noisy aerial fireworks. Rodney horse owner, Alice Hayward's horse was killed during a commercial pyrotechnics display held nearby. “We don't want to stop people's fun, but asking for people to think about the effects on neighbours and their livestock” says Alice. “Our animals can not speak, but I hope my horse's tragic death will be a voice for other animals"
Key messages this fireworks season are to be aware of the potential heartache, and the financial costs you can cause your neighbours (and therefore be responsible for). You must notify your neighbours to allow them to protect their stock, but be aware, that you are still financially responsible for all costs caused by your fireworks if they cause injury or damage. 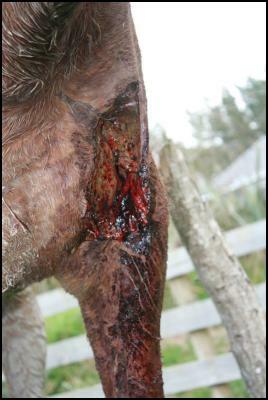 Livestock and horses may be valued at tens of thousands of dollars, and even relatively simple injuries may require hundreds, or thousands of dollars of veterinary care. Find more from Ban the Boom NZ on InfoPages.